For this module we fit model parameters so that computed current waveform matches measured current waveform. First we configure the UPFL for PF1000 operating in Deuterium; using trial model parameters. We fire a shot. We do not know how good our results are without a reference point; ie some comparison with experimental results. A total current waveform of the PF1000 has been published; we have it in digitized form. To ensure that our computed results are comparable to experimental results, the key step is to fit model parameters, by adjusting the model parameters until the computed total current trace matches the measured total current trace. To do this, we add a Sheet 2 to our numerical plasma laboratory; place the digitized data of the measured trace in Sheet 2 and plot this trace in a chart. Next we plot the computed current waveform in the same chart. The model parameters are varied; at each variation the focus is fired, and the computed current waveform is compared with the measured waveform. The process is continued until the waveforms are best matched. A good match gives confidence that the computed results (trajectories, speeds, temperature, neutron and radiation yields etc) are comparable with actual experimental results. After the guided fitting of the PF1000, we have a self exercise to fit the Chilean PF400. We then tabulate important results of both machines, and do a side-by-side comparison of a big vs a small plasma focus to obtain important insights into scaling laws/rules of the plasma focus family. (d) To vary the model parameters until the two waveforms have the best match. (e) Exercise 2: Tabulate results for PF1000 obtained in our numerical experiment. (f) Exercise 3; participants to fit the PF400 and tabulate the results for PF400 side by side with the results for PF1000, for a comparative study. You need File7RADPFV5.15b (called File7) for the following work. Copy and Paste a copy on your Desktop. You also need the files PF1000data.xls, PF400data.xls and compareblank.xls for this session. Use the cursor to drag each file onto your desktop. Double click on File7 (Excel logo File7RADPFV5.15 on your Desktop). Model: massf=0.073, currf=0.7, massfr=0.16, currfr=0.7; our first try. Or follow the guide in A4-F4, to key in A5-F5 for the relevant parameters. The program runs and results are displayed in columns and also in figures. Is our simulation any good? Not if there is no reference point!! To assess how good our simulation is, we need to compare our computed current trace with the measured current trace, which has been published. (i) The PF1000 current waveform is in the file PF1000data.xls. You now want to place this data into File7 as Sheet2. With File7 open, click on ‘File’ tab; drop down appears, click on ‘Open’. Look in: Desktop; select PF1000data.xls; double click to open this file. Click on ‘Edit’ tab; select ‘Move or Copy Sheet’. A window pops out; ‘Move selected sheets To book’; select ‘File7RADPF13.9b.xls. ‘Before Sheet:’ select ‘(move to end)’. Click ‘OK’. You have copied PF1000data.xls into File7 as Sheet1(2); you might like to rename Sheet1(2) as Sheet2. (ii) Chart the measured current waveform: The measured current waveform is already charted in Sheet2. You may adjust the size and position of the chart for your preferred viewing. To place the computed current waveform on the same chart: Position the cursor on the chart containing the measured current waveform. Now right click. Pop-up appears. Select ‘Computed Current in kA’ in the name box. In the next steps we will place the computed current data from Sheet 1 into this same chart in Sheet 2, by the following procedures. Place the cursor in the box against ‘X values’ by clicking. Then type in the following string: “=sheet1!$a$20:$a$6000” [without the quotation marks]. Next click in the box against ‘Y Values’ and type in the following: “=sheet1!$b$20:$b$6000” [without the quotation marks]. Click button ‘OK’. The pink trace (see figure below) is the computed current trace transferred from Sheet 1 (where the time data in us is in column A, from A20-Aseveralthousand; and corresponding computed current data in kA is in column B, from B20 to B severalthousand). We are selecting the first 5980 points (if that many points have been calculated) of the computed data; which should be adequate and suitable. Comparison of traces: Note that there is very poor matching of the traces; using the first try model parameters. that the computed current maximum is too low. during the axial phase; here the inductance per unit length L’=(m/2p)*ln(b/a) This too high speed would also lower the peak current. To reduce the axial speed, we could increase the axial mass factor. We note that the axial phase ends too early by some 20%; indicating the axial speed is too fast by 20%. In the plasma focus (as in pinches, shocks tubes and other electromagnetically driven plasma devices) speed~density^0.5. So the correction we need is to increase the axial mass factor by 40%. So try an axial mass factor of 0.073x1.4~ 0.1. We toggle to Sheet 1 by clicking on ‘Sheet 1’ (just below the worksheet). Click on cell A7, and type in 0.1. Fire the focus by pressing Ctrl+A. Program runs until complete, and results are presented. Note TRadialStart (H16) has increased some 0.7 us. Toggle to Sheet 2 (ie click on Sheet 2 just below work sheet). Note that the computed current dip is now closer to the measured in time (still short by some 10%; reason being that increasing axial mass factor reduces the speed which in turn causes a reduced loading. This increases the current which tends to increase the axial speed so that our mass compensation of 40% becomes insufficient). The value of the computed peak is also closer to the measured. So we are moving in the right direction! But still need to move more in the same direction. Next try axial mass factor of 0.12. Toggle to Sheet 1, type 0.12 in A7. Fire. Back to Sheet 2. Note improvement in all 3 features. In similar fashion, gradually increase the axial mass factor. When you reach 0.14 you will notice that the computed current rise slope, the topping profile, the peak current and the top profile are all in good agreement with the measured. The computed trace agrees with the measured up to the start of the dip. Note that the axial model parameters at this stage of agreement are: 0.14 and 0.7. You may wish to try to improve further by making small adjustments to these parameters. Or else go on to fit the radial model parameters. Note that the computed current dip is not steep enough, and dips to too low a value. 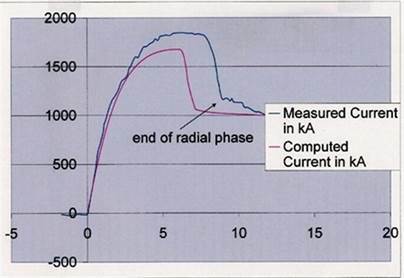 This suggests the computed radial phase has too high a speed. Try increasing the radial mass factor (cell C7), say to 0.2. Observe the improvement (dip slope becomes less steep) as the computed current dip moves towards the measured. of the dip is still excessive. Imagine if very little of the current flows through the pinch, then most of the total current will flow unaffected by the pinch. And even if the pinch were a very severe one, the total current (which is what we are considering here) would show hardly a dip. So reducing the radial current fraction, ie currfr (or fcr) should reduce the size of the dip. Let us try 0.68 in cell D7. Notice a reduction in the dip. By the time we go in this direction until currfr is 0.65, it becomes obvious that the dip slope is getting too shallow; and the computed dip comes too late. One possibility is to decrease massfr (which we note from earlier will steepen the dip slope); which however will cause the dip to go lower; and it is already too low.. Another possibility is to decrease the axial phase massf, as that will also move the computed trace in the correct direction. Try a slight decrease in massf, say 0.13.
axial speed. This suggests a slight decrease to circuit residual resistance ro ( or changes to Lo or Co; fitting those could be tricky, and we try to avoid unless there are strong reasons to suspect these values). Easier to try lowering ro first. Try changing ro to 6.1 mW. The fit is quite good now except the current dip could be steepened slightly and brought slightly earlier in time. Decrease massfr, say to 0.35. The fit has improved, and is now quite good, except that the dip still goes too low. At this stage we check where we are at. Toggle to sheet 1. Note from sheet 1 that the radial phase ends at 9.12 ms. Back to sheet 2. 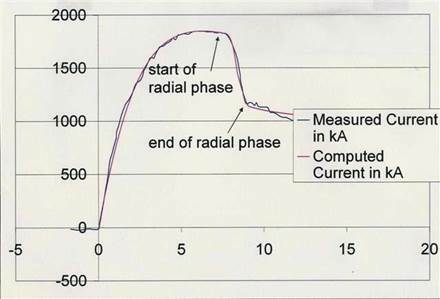 So we note that the computed curve agrees with the measured curve up to the end of the radial phase with a difference of less than 0.02MA out of a dip of 0.66MA (or 3%). The fitting has already achieved good agreement in all the features (slopes & magnitudes) of the computed and measured total current traces up to the end of the radial phase. Do not be influenced by agreement, or disagreement of the traces beyond this end point. So we have confidence that the gross features of the PF1000 including axial and radial trajectories, axial and radial speeds, gross dimensions, densities and plasma temperatures, and neutron yields up to end of radial phase may be compared well with measured values. Fill up the following table. Use the file compareblank.xls for this purpose. Given: the current waveform data of the PF400, digitized from a published waveform. The data is in the file PF400data.xls. Your job: is to fit model parameters until the computed current waveform matches the measured waveform. Some guidance is given below. Copy a clean copy of File7RADPF05.14.xls (called File7) from your Reference folder to your Desktop. Open File 7. Transfer computed current data from Sheet 1 onto Sheet 2; using strings: “=sheet1!$a$20:$a$6000” [without the quotation marks] &: “=sheet1!$b$20:$b$6000” [without the quotation marks]. No trace of computed current appears yet, since we have not yet ‘fired’ PF400. Write down the bank, tube and operating parameters (from the table in the lower part of the page, NOT from the top line, which contains some nominal values). Toggle to Sheet 1. Key in the following bank and tube parameters and the operating parameters. Key in the first try model parameters; [scroll a little to the right and use the suggested parameters for the UNU ICTP PFF, cells T9-V9]. Fire PF400; and see the comparative results by toggling to Sheet 2. Suggested first steps: Fit the axial region by small adjustments to fm and fc, where necessary. In fitting the axial phase, the more important region to work on is the later part of the rising slope and the topping profile towards the end of the axial phase. So each time you should note the position of the end of the axial phase from Sheet 1 and locate that position on the Chart in Sheet 2, using the cursor. Final steps: When you have done the best for the axial phase up to the end of the axial phase, then proceed to fit the radial phase. Tip: The dip for the PF400 is not very dramatic. Enlarge the trace so the rollover and the dip can be more clearly compared. Q3: Complete the Excel Sheet which you started in the last Exercise; to compare a BIG (~500kJ) plasma focus with a small one (~400J). As you fill up, note particularly each group of ratios (each group is denoted by a different colour). Note particularly the order of magnitude of the ratios. [use the Excel sheet, rather than this table]. The ratios below were calculated from the actual PF1000 and PF400 results; and left here as a check for you. Calculate your own ratios from your own results. At the end of the exercise save this Excel Sheet as PFcomparison.xls. It will be used again next week. Make up the following table comparing a BIG plasma focus with a small one. or (ratio of Ipeak); ratio of temperature (orange*) is a special case, because of the difference in values of c.
This table summarises the results of our numerical experiments for Week 2 of the course. It could be the start of a compilation covering all focus machines for which measured current traces are available. 1. How does rmin, zmax, and pinch duration, scale primarily with anode radius 'a'? Should there be a relationship? 2. How does the (pinch volume*pinch duration) scale with 'a'? Should there be a relationship? 3. What is the significance of the Speed Factor S? 4. How should the neutron yield scale? With storage energy E, with Ipeak, with Ipinch? In these two sessions we have learned how to fit a computed current trace with a measured current waveform, given all bank, tube and operational parameters. For the PF1000 we obtained a good fit of all features from the start of the axial phase up to the end of the radial phases; giving confidence that all the computed results including trajectories and speeds, densities, temperatures and neutron and radiation yields are a fair simulation of the actual PF1000 experiment. We also fitted the Universal Plasma Focus Laboratory to the PF400. We tabulated important results of the two machines side by side. The axial speed is also almost the same; in which case the radial speeds would have been almost the same, except they (the radial speeds) are influenced by a geometrical factor [(c^2-1)/lnc]^0.5. For these 2 machines the factors differ by 1.5; hence explaining the higher radial speeds in PF400; and also the higher temperatures in the smaller PF400. The pinch dimensions scale with ‘a’ the anode radius. The pinch duration also scales with ‘a’, modified by the higher T of the PF400, which causes a higher small disturbance speed hence a smaller small disturbance transit time. In this model this transit time is used to limit the pinch duration. Finally we may note that just by numerical experiments we are able to obtain extensive properties of two interesting plasma focus machines apparently so different from each other, one huge machine** filling a huge hall, the other a desk top device. Tabulation of the results reveal an all important characteristic of the plasma focus family. They have essentially the same energy per unit mass (S ). A final question arising from this constant energy/unit mass: Is this at once a strength as well as a weakness of the plasma focus?